Cheshire West and Chester Council has been recognised in the 2018 RSPCA PawPrint Awards, picking up a Gold accolade for the seventh year in a row. The Council scooped the Gold Community Animal Welfare Footprint (CAWF) Award for exceeding legal requirements in the way it handles stray dogs. The Awards celebrate local authorities that go above and beyond to ensure high animal welfare standards in their communities. The national animal charity has once again recognised the hard work and dedication of Regulatory Services staff involved in the collection and re-homing of stray dogs and the fact that the service has clear procedures and education programmes in place. Part of this involves awareness-raising and includes linked initiatives like the Council’s approach to dealing with anti-social behaviour such as failing to clean up after your dog. During office hours, any dogs collected in Cheshire West and Chester are scanned immediately for the presence of a microchip and, if possible, returned without charge to their owner. If there is no microchip, the collar information will be used, if available. If return is not possible at this time, the dog is taken to the kennels. Outside of office hours, dogs are taken immediately to the kennels and are scanned on arrival. In 2017/18, 116 dogs were returned to their owners without charge because their owners could be identified and contacted by the warden. Many more may have been returned without the intervention of the dog warden as finders are able to identify the owner by the collar information. The Council’s Cabinet Member for Environment, Councillor Karen Shore said: “It is a wonderful achievement to secure this award for the seventh year running. “The dog warden team continues to do a marvellous job and has, yet again, been recognised for this by the RSPCA award. We continue to work to reunite as many dogs as possible with their owners. 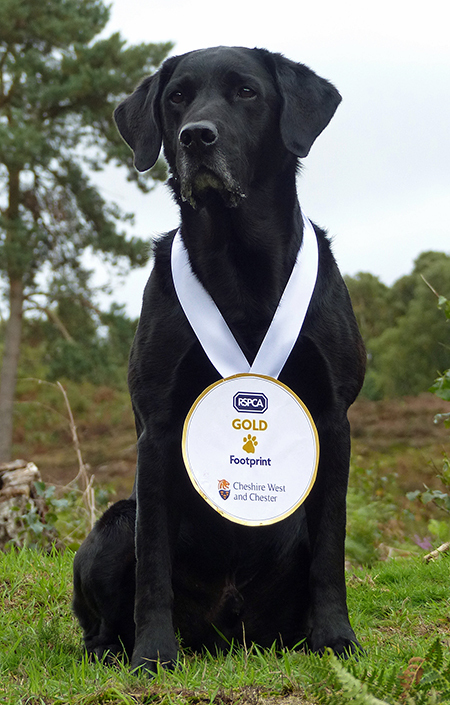 Basil the Black Labrador is proud of Cheshire West and Chester Council’s achievement.